Your lifestyle affects your health more than the combined effects of your genetic makeup and relationship with your doctor. There are enough studies that confirm the above; this should now be considered a fact! Interpersonal—interactions with family and friends, digital friends and social networks. Community—the culture of the neighborhood. Organization—schools, faith-based organizations, and professional organizations. Policies & Laws—dictating societal norms and cultures. There should be a sixth level for the Media; the media is crucial in disseminating information—Policies and Laws—that affect organizations, communities, interpersonal interactions and intrapersonal beliefs and values that affect attitudes and behavior. The media has the greatest power to affect change. The internet has made the world global. 6. Media (not shown) includes internet; source of information outside our circle; the Internet connects us all. The interplay between the person and the surrounding world. Did you know that the brain structurally changes in response to the environment? This is neuroplasticity. Our brain exhibits neuroplasticity, more so in the first five years. It responds to the environment and the environment responds to it. That means we can change. 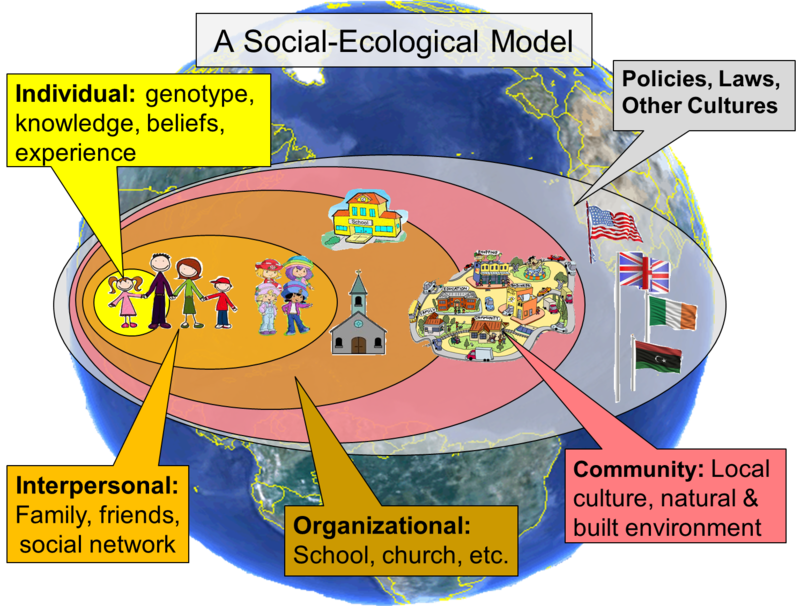 The Social Ecological Models (SEM) is a good visual aid to determine the various intervention points. Since lifestyle plays a pivotal role in health, shouldn’t we observe and listen to our environment? What is it telling you? It is telling me our failure to listen is linked to the increasing levels of stress and cases of mental illness in the last decade. Our failure to listen is ignoring the cumulative effects of environmental toxins. Is our failure to listen creating these bizarre weathers and natural disasters? ← WHERE WOULD YOU MOST LIKE TO VISIT ON YOUR PLANET? Thank you Jenny. It was from google images.